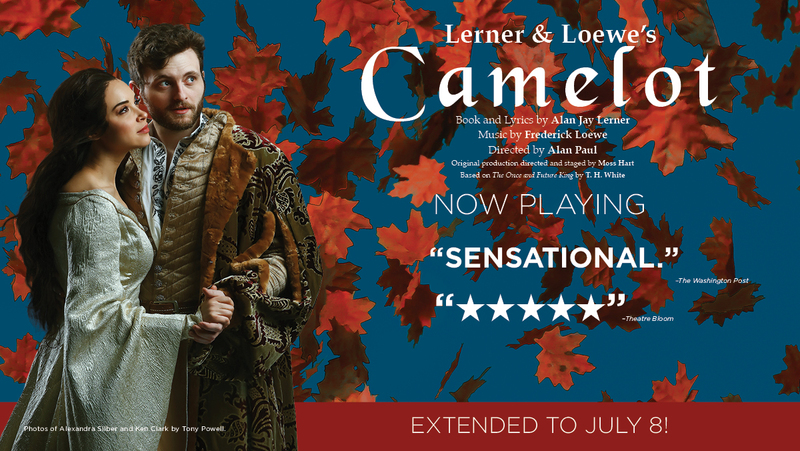 By Martin Morse Wooster: I’ll guess that Alan Jay Lerner and Frederick Loewe’s 1960 musical Camelot is a musical you’ve heard about but probably haven’t seen. Yes, there was a movie in 1967 and an HBO version in 1982, but my sense is that this musical is lost in the mists of theatrical history. Most of us know about how Jacqueline Kennedy, a week after John F. Kennedy’s assassination, declared that the musical was one of JFK’s favorites. A few of us know a few of the show’s songs. But I suspect this is a show most people haven’t seen. Well, I came to the show, currently at the Shakespeare Theatre in Washington, prepared. Last year, thanks to my book club, I had read the great novel this musical is based on, T.H. White’s The Once and Future King. Weirdly, the normally well-prepared Shakespeare Theatre bookshop, which would happily sell you books by Sir Thomas Malory or Howard Pyle, or a 33-piece “build your own castle” toy set, had no copies of White’s novel for sale. White’s book is in two parts. The first part, The Sword in the Stone, is a funny novel about young Arthur, before he became king, and his education by sorcerer Merlyn, who turns him into various animals to teach him what the world is like. Disney turned this part into a carton in 1963. The second part, which encompasses several hundred pages, is about Arthur, once he became king, and how he built the Round Table as a way of having knights do something constructive rather than endlessly bash each other. White then shows the Round Table’s collapse, in part due to the adulterous relationship between the best knight in the realm, Sir Lancelot, and King Arthur’s wife, Guenevere. After all this work, how much of The Once and Future King is left? My sense is that the first half is reasonably close and the second half does a great deal of condensing. The story begins with Arthur about to be married reminiscing about his days being educated by Merlyn, and how he was once called “Wart.” But Merlyn teaches Arthur to move forward with his life, and Arthur recalls that when he was an eagle, he noticed there were no physical boundaries between all of the little kingdoms that constituted the England of his time. He then reveals how he became king by pulling the sword out of the stone and resolves to have all the knights work together in the Round Table, a place where no one is the head. The call for knights includes people from all over the world, including France, where Lancelot shows up. Lancelot is the most accomplished knight, but he also falls in love with Arthur’s wife, Guenevere. Their infidelity, fueled by the appearance of Arthur’s son Mordred, ultimately leads to the collapse of Camelot. Most of this is in White, but there’s a great deal of simplification as well as the lack of several major characters. If you’re a fan of Sir Galahad or Sir Bors, you won’t find them in Camelot. Still, Lerner and Loewe did a good job in boiling down White’s complex novel. The Internet Movie Database tells me that The Once and Future King has never been filmed. Surely companies hungry for fantasy miniseries might want to give it a try? Meanwhile, Variety says that The Sword in the Stone, which has been in development with Disney since 2015, is scheduled to be filmed as a live-action remake in 2019, with Juan Carlos Fresnadillo attached as director. The Shakespeare Theatre production of Camelot was excellent, with the three leads—Ken Clark as King Arthur, Alexandra Silber as Guenevere, and Nick Fitzer as Lancelot de Lac, having superb voices, although director Alan Paul shouldn’t have made Fitzer use a plummy French accent. Two long-established character actors in Washington, Ted van Griethuysen as Merlyn and Floyd King as King Pellinore, were also good in their parts. Merlyn is a small part in Camelot, but King Pellinore is a substantial role, and King was very funny. I think the last time Camelot played in Washington was in 2003. I hope I will not have to wait another 15 years to see this great fantasy musical again. Which should not be confused with a “camel lot,” which is where you park your camel.